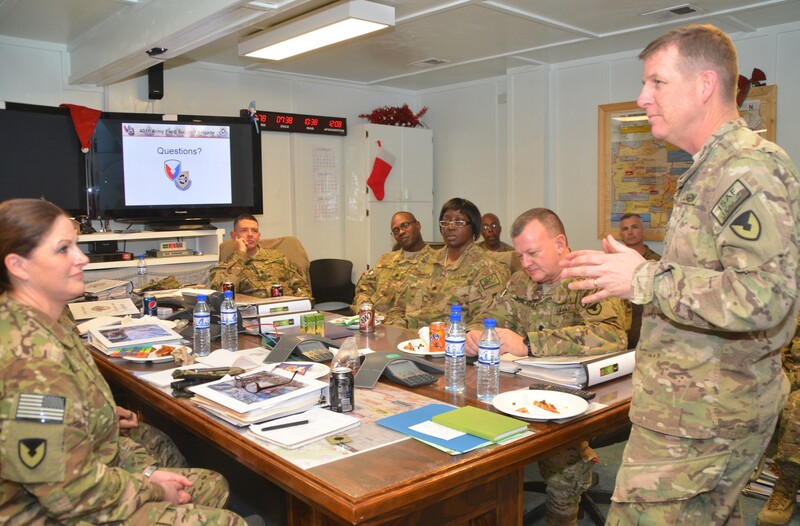 BAGRAM AIRFIELD, Afghanistan -- Col. Mark Paget, commander, 401st Army Field Support Brigade, provided a welcome brief and new marching orders Dec. 27 to the recently arrived Logistics Civil Augmentation Program support officers on their task and purpose to meet drawdown goals. The officers and noncommissioned officers will be representing LOGCAP at forward operating bases across the battle space. Paget challenged them to meet with the senior tactical commanders they support within 30 days and have a plan to show them how to meet drawdown requirements and reduce contractor headcount by tailoring LOGCAP services to their specific needs. In theater, LOGCAP falls under the 401st AFSB and is the Army's premier capability to support global contingencies by leveraging corporate assets to augment Army current and programmed sustainment force structure. The LOGCAP performance contractors are able to facilitate commanders more than 80 specific services ranging from dining facilities, laundry, water production to fire, crash and rescue. It is up to the commander to determine which services are procured from LOGCAP.